You are here: Home / Life / NBA Playoffs: If Heat Lose, What’s LeBron’s Legacy? NBA Playoffs: If Heat Lose, What’s LeBron’s Legacy? There are stories that matter and there are stories that mean much less than they are hyped up to be. Thank you, ESPN. As we head into the NBA playoffs, lets look at the biggest storylines, both legitimate and illegitimate. Legitimate: What effect will Derrick Rose’s health have on the Bulls’ title hopes? Like last year, the Bulls are scrappy, fundamentally sound, determined and focused night in and night out, giving them the No. 1 seed once again. The main difference this year is they’ve had to do it without the 2011 NBA MVP. Without Rose, the Bulls have continued to win and have shown their ability to be a top team without him. Or have they? In the month of April, where Rose missed significant time, the Bulls have the third-worst offensive efficiency rating in the league. As the Bulls role players beat up on lesser competition, they have fooled some into diminishing the importance of Rose. This is a big mistake. As the Bulls get deeper in the playoffs, the defensive intensity will turn up and the ability to get baskets will become increasingly more difficult. As a result, Rose will need to be at a 100 percent – MVP level – to get to the basket at any time for the Bulls to have a chance to get past the Heat. Illegitimate: Does Ron Artest’s suspension kill L.A.’s chances for a serious run deep in the playoffs? Talk of the length of Artest’s suspension for his Mike Tyson-esque elbow has dominated sports talk the past week. After news that Artest will be serving a seven-game suspension, some have cited this as a reason to discount the Lakers’ chances for winning a potential round-two matchup against the Thunder. First of all, even with Artest, the Lakers did not have a great shot to beat the Thunder. While Kobe continues to hit impossible shots, he now lacks the athleticism or first step necessary to beat his man one on one. Their second-best player, Andrew Bynum, has been more worried about showing up coach Mike Brown lately than getting double -doubles. The Lakers’ miraculous double OT win last Sunday occurred when Russell Westbrook and Kevin Durant both played their worst ball. The Lakers can’t count on that to continue throughout a seven-game series. Artest’s suspension isn’t as important as many are making it seem because the Lakers simply are destined to a one-and-out fate. 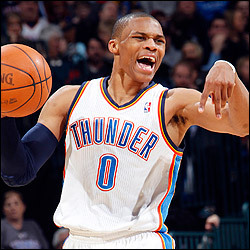 Legitimate: Will Westbrook’s style of play, especially in crunch time, hurt the Thunder down the stretch? Westbrook is one of the most explosive players in the league. He may be the most athletic point guard of all time. But time and again he forgets two hard truths: 1) He is not the Thunder’s best player. 2) He plays the point guard position. Illegitimate: There are more than four teams that have a real chance at winning the NBA finals. Don’t let the media play up the possibility of a Cinderella team. Heat, Bulls, Thunder and Spurs — that’s all folks. The Lakers are too old and aren’t playing their best ball. Speaking of old, say hello to the AARP card-carrying Boston Celtics. While for much of the year it looked like a sure thing to see the Heat vs. Thunder in the Finals (and that’s probably still the favorite), the Spurs have been playing inspired ball with Tony Park at the helm. And the Bulls play basketball too well as a team to ever be discounted (unless Rose isn’t healthy). So yeah there’s 16 basketball teams in this tournament, but wake me up when we reach the final four. Legitimate: Will Carmelo Anthony elevate his play to show he can outplay both LeBron and Wade? Carmelo Anthony has been on an absolute tear since Mike D’Antoni was fired. No more fast-break offense looking to spread the floor and hit quick 3s. More conducive to Anthony’s strengths, the Knicks have let Anthony work in isolation both in the low post and elbow extended. He has been a man on a mission who is regularly scoring over 30 points and making anyone who forgot about him among the league’s elite bite their words. Anthony was in the same draft class as LeBron and I’m sure will revel at the chance to show that he is just as an elite player as the much more talked about and publicized LeBron. While LeBron’s clutch gene has been questioned, there is little evidence to knock Anthony’s big game and big moment dominance. Look for Anthony to take over the end of games and give both Wade and LeBron a real run for their money. No athlete ever has had more pressure on him than LeBron James. The non-stop, 24-hour sports media has placed absurd expectations on James. But somehow, a 27-year-old, soon to be three-time MVP, has been placed in a championship-or-bust situation. Many have said anything he does in the regular season or even the playoffs will not matter. People will only care to change their opinion if he delivers a clutch performance in the NBA Finals. What other player ever has had such expectations? Can we not forget LeBron’s dominance in his first six years when he proved he has one of the most complete skill-sets of any player in NBA history? Also, let’s not forget his dominant performance last playoffs where he made Rose look like a rec-league player. LeBron is a great player and is 27. He doesn’t need to win the championship this year to solidify his place among the greats. He’s not retiring anytime soon.